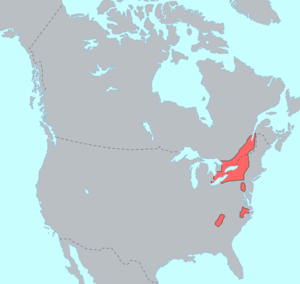 The Iroquoian languages are a First Nation and Native American language family in North America. They are known for their general lack of labial consonants. Iroquoian languages are polysynthetic and head-marking. Today, all surviving Iroquoian languages except Cherokee and Mohawk are severely endangered, with only a few elderly speakers remaining. In 1649 in the middle-Beaver Wars, the tribes constituting the Huron, and Petun (Tabacco) confederations were displaced by war parties from Five Nations villages (Mithun 1985). Many of the survivors gathered, displaced away from Lake Erie well to the north of their previous territories, ultimately forming the Wyandot nation. Between 1650-55 the Neutral, Wenro, and Erie nations in succession were also destroyed in territorial wars of aggression previously unknown and uncharacteristic of Amerindian behaviors before European contact. (†) — tribes and language are extinct. Scholars are finding that what has been called the Laurentian language appears to be more than one dialect or language. Ethnographic and linguistic field work with the Wyandot tribal elders (Barbeau 1960) yielded enough documentation for scholars to characterize and classify the Huron and Petun languages. The languages of the tribes that constituted the tiny Wenrohronon[lower-alpha 3], the powerful Susquehannock and the confederations of the Neutral Nation and the Erie Nation were very poorly documented. They are historically grouped together, and geographically the Wenro's range on the eastern end of Lake Erie made them abutting neighbors sandwiched between the two larger confederations. To the east of the Wenro beyond the Genesee Gorge was the lands of the Iroquois and southeast beyond the head waters of the Allegheny River lay the Susquehannocks. The Susquehannocks and Erie were militarily powerful and respected by neighboring tribes. These groups were called Atiwandaronk, meaning 'they who understand the language' by the surviving Huron (Wyandot people). By 1660 all of these peoples but the Susquehannocks and Iroquois were defeated and scattered, migrating to form new tribes or to be adopted into others—the practice of adopting valiant enemies into the tribe being a common cultural tradition of the Iroquoian peoples. ↑ Geographically, the Huron peoples ranged from just west of Montreal along the left/north bank St. Lawrence River and the whole northern shores of Lake Ontario and Lake Erie. Along the opposite bank ranged the fierce Iroquois Confederation, and the two oft made war and just as often, had peaceful relations until the Europeans introduced a demand for furs and the lure of firearms. ↑ As a result of ongoing white intolerance and bloodletting, in the very late 1600s Tuscarora family groups began making their way northward along the Allegheny Front and joined the Iroquois in New York—eventually, ca. 1725 so many had migrated they obtained tribal lands there of their own and became the sixth Iroquois nation. ↑ Historical examination of the Jesuits records suggest ca 1640-42 the Wenro may have had as few as three villages sandwiched between Buffalo & Rochester (Niagara and Genesee Rivers). ↑ Hammarström, Harald; Forkel, Robert; Haspelmath, Martin; Bank, Sebastian, eds. (2016). "Iroquoian". Glottolog 2.7. Jena: Max Planck Institute for the Science of Human History. ↑ Mithun, Marianne. "Grammaticalization and Polysynthesis: Iroquoian" (PDF). Retrieved June 8, 2015. ↑ "Iroquoian Languages". www.languagegeek.com. Retrieved 2015-08-09. ↑ "Certificate in Iroquois Linguistics for Language Learners". University College. Retrieved 2012-09-06. ↑ Gale Courey Toensing (2012-09-02). "Iroquois Linguistics Certificate at Syracuse University Comes at Important Time for Native Languages". Indian Country Today Media Network. Retrieved 2012-09-06.